Marriage Tax Allowance Claims – Could You Cut £900 From Your Tax Bill This Year? 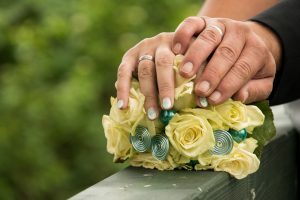 According to HMRC figures and a BBC report, there were just over 4 million couples in the UK (either married of in civil partnerships) who could have claimed the ‘marriage allowance’ last year. Yet, since it launched in 2015, only 2.2 million have done. So if you’re one of the people who hasn’t looked into it because you don’t know about it or you assume you won’t be eligible, it’s time to take a closer look. What Is The Married Couple’s Allowance? One of the longest standing and biggest financial frustrations of being in a partnership is when one of you earns less than the current personal tax allowance threshold, but you can’t transfer any of that surplus allowance to your partner. But in 2015 there was a change. From 2015 onwards, you’ve been able to take 10% of your tax allowance and give it to your spouse/partner in a marriage allowance transfer. Suppose you’re a teaching assistant. You earn about £9,000 a year, but the personal tax allowance 2017/2018 was £11,500. So that’s £2,500 extra you could have earned tax free, but you didn’t because your wages just aren’t that high. Until 2015, you’d have lost all the benefit of that £2,500 of personal tax allowance. Now, you can transfer up to 10% of tax allowance to your partner, providing you haven’t used it. So in this case, you’d be able to give your partner £1,150 of your tax allowance. That means they wouldn’t have to pay tax on an extra £1,150 of income, over and above their own existing personal tax allowance. That would be worth £230. If The Marriage Tax Allowance Was Worth £230 Last Year, Where Does The £900 Figure Come From? The great thing about the HMRC marriage allowance is you can backdate it to 2015, or as far back as you meet the criteria. Obviously, you’ll need to have been in a marriage or civil partnership from the point you claim, and you’ll also need to have satisfied the income requirements each year since then to claim the full backdated amount. Each year, the personal allowance changes, so the amount you could have claimed has changed too. In 2015 it was worth £212. The personal tax allowance 2016-2017 was £11,000, so the marriage allowance was worth £220, then £230 and in 2018 its value rises to £238. Add those together and you reach a total in excess of £900. As long as one of you continues to earn less than the personal tax allowance and the other remains below the higher tax bracket, you’ll continue to benefit from a £200+ marriage tax boost each year. It’s also worth remembering that the married couple’s tax allowance can be backdated even if your partner has died since 2015. This part’s crucial: the person who needs to apply is the lowest earner (i.e. the person transferring part of their personal tax allowance). You can apply online and it’s a simple process: you’ll just need the National Insurance numbers for you and your partner, and proof of identity. Once you have submitted your application you’ll get an email to confirm your application has been received and another to confirm the HMRC’s decision. As long as you remain eligible for the marriage tax allowance, you’ll continue to have 10% of your tax allowance transferred to your partner each year. What If I Earn Less Than My Tax Allowance, But Not 10% Less? A curious quirk of the marriage allowance transfer rules means that you can transfer all of it, or none of it, but you can’t transfer a part of it. Even so, it may still be worthwhile doing even if your wages creep over the threshold. Let’s go back to our teaching assistant, who this year is working a few extra hours and has had a pay rise to boot, bringing earnings to £11,000. The personal tax allowance this year is £11,850, and once again 10% of it is transferable. £11,850 – £1,185 (10%) leaves a new personal tax allowance for this year of £10,665, so there’s now a gap of £335 between earnings and personal allowance. That amount will be taxable, and at 20% that will mean tax deductions of £67. The benefit to the partner, however, is £238 and you don’t have to be a maths whizz to work out that on that basis the marriage couples’ allowance is something that’s still very much worth doing. What Happens If My Wage Fluctuates Month To Month? The key calculation is the amount you and your partner earn in a year. So if you do some extra shifts that give you a bumper month it doesn’t matter as long as the total for the year remains below the tax allowance threshold. Similarly, as long as you remain within the 20% tax bracket for the year, it doesn’t matter that, for a couple of months, you earned what would otherwise be a higher tax rate income. Naturally, neither you nor HMRC will know for sure how much you and your partner have earned in a year until the year is done. If it turns out that you owe HMRC money, they’ll recover it through self-assessment or payroll. If you’ve not considered applying for married couples tax allowance before and you think you might qualify, do it now. It could save you hundreds of pounds.